Enough experts David Sullivan and Noel Atama assess the conflict minerals trade in Congo based on firsthand field research. Congo’s mineral wealth continues to play a central role in the country’s conflict dynamics. Despite the upsurge in displacement and atrocities during 2009, multinational companies continue to purchase minerals from the war zone, providing crucial fuel for the violence. Both the opportunities for Congo to escape from its catastrophic crisis cycle and the threats that could plunge it into renewed all-out war are directly connected to the fate of the mineral sector and the manner in which natural resources are utilized during the coming months. The latest report of the U.N. Group of Experts on the Democratic Republic of the Congo lays out in detail the prominent role of the minerals trade in the financing of Congo’s ongoing conflict. Findings confirm the impressions we gleaned during recent travel to North and South Kivu, where the pursuit of mineral resources by armed elements on all sides of the conflict has only accelerated under the accord between Rwanda and Congo and the Kimia II military offensive against the Democratic Liberation Forces of Rwanda, or FDLR, by the Congolese army, which has the United Nations’ support. In particular, Congolese army units composed primarily of former members of the National Congress for the Defense of the People, or CNDP, have expanded their control of mineral-rich regions within the context of Kimia II, compounding volatile political and ethnic grievances in these regions. And according to the U.N. Group of Experts Coordinator Dinesh Mahtani, Rwanda continues its economic partnership with these elements. Meanwhile, the constellation of armed groups operating outside of the government’s control continue to benefit from access to minerals, resources that substantially impede efforts to bring security and stability to the Kivus. Contrary to critics who argue that the militarization of mining in eastern Congo is purely symptomatic of a dysfunctional security sector and poor governance, conflict minerals are both a cause and consequence of Congo’s dilapidated state apparatus. The easy availability of lootable natural resources, especially tin, tantalum, tungsten, or the 3Ts, and gold, with their well-developed trade routes and willing international buyers, foments the fragmentation of armed groups in eastern Congo. With only a few guns and shovels, local warlords can establish themselves as a group that must be reckoned with, financing their own growth into a militia powerful enough to demand a seat at the table in negotiations and eventually a position in the army—from where they can continue to profit from the minerals trade. Moreover, in the battle for control of resources, competing networks of armed groups, businesses, and political elites routinely manipulate Congo’s contentious and inflammatory grievances that surround sensitive issues such as ethnicity and land tenure. The inability of the Congolese government to control its territory and protect its population creates the opportunity for illicit networks to fill the vacuum, but the objective of these networks remains profit, predominantly from the mineral trade. There remain ample opportunities to capitalize on gains achieved in recent months by utilizing the mineral trade to deliver significant peace dividends for the people of eastern Congo. This will require new levels of leadership both from the Congolese government and the international community, and broad participation by engaged elements of Congolese government agencies, the business community, and civil society. Thanks to increased international attention, including strong statements by U.S. Secretary of State Hillary Clinton during her visit to eastern Congo, all of the actors with a role in Congo’s conflict mineral drama are feeling the pressure to change their behavior. Actors in the private sector both within Congo and in the international supply chains for electronics and other industries have signaled a willingness to provide new levels of due diligence and corporate responsibility. Yet it is equally clear that a number of actors remain highly invested in business as usual with regard to conflict minerals, and that palpable change on the ground can be the only barometer of true success. 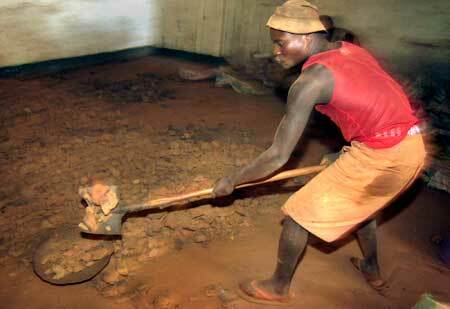 Congo's minerals leave a trail of destruction as they travel from the mines to the phone in your pocket. The direct targeting of mining areas during the Kimia II offensive rocked the status quo in the Kivus. Previously, the conflict mineral trade experienced a period of relative calm in terms of fighting between armed groups for control of mines. In fact, battlefield enemies often colluded to profit from the mineral trade while continuing to exploit and prey upon local populations, with the degree of violence involved varying considerably. The rapprochement between Rwanda and Congo fundamentally upset this equilibrium, with the Congolese army incorporating elements from the CNDP and other armed groups and moving to attack the main positions of its longtime ally and sometimes business partner, the FDLR. The Kimia II offensive has dislodged the FDLR from control of key mining areas and trade routes, but it has also allowed the Congolese army, or FARDC—especially units composed predominantly of former CNDP troops—to seize mining sites and establish new levels of control over the trade. At the same time, the expanded CNDP presence has inflamed tensions with local populations still scarred by the conduct of the CNDP and its antecedents, especially the period of occupation of eastern Congo by Rwanda and its proxies from 1998 through 2002. Given the fluidity of the security situation in the Kivus, a complete analysis of the impact of military operations on mining sites is beyond the scope of this report. Instead, we will examine a few critical case studies that point to the broader questions surrounding current efforts to deal with Congo’s conflict minerals. At 3:30am on August 12, approximately 80 armed men attacked the massive Bisie mining site, killing some 30 people and wounding 50. The objective of the attack appeared to be pillage, as attackers made off with mineral resources and supplies. The assault was well planned, with some of the attackers reportedly having infiltrated the area earlier that day posing as vegetable sellers. Some of the attackers spoke the local language, while others spoke Kinyarwanda. FARDC forces who were present in the mine did not return fire, with explanations for this ranging from the practical (they were outnumbered and most of the troops were actually busy digging in the mines at the time) to the credulous (they decided to hold fire due to concern for civilian casualties) to the conspiratorial (they may have been in on the attack). Bisie is the largest mine in the Kivus and the source of approximately 75 percent of North Kivu’s cassiterite, or tin ore, production. Before this year, Bisie was under the control of the nonintegrated 85th Brigade of the Congolese Army, a former Mai Mai militia that operated outside the control of the Congolese government, but whose commander has been linked to senior Congolese army officers who profit from the mine. By March 2009 the 85th brigade was transferred out of Bisie to Hombo on the border between North and South Kivu, and it was replaced by a rapidly integrated Congolese army brigade led by former CNDP commanders and mainly consisting of former CNDP elements. Although a few men loyal to the 85th brigade remained in the area and continued to supervise certain mineshafts, the restructuring substantially shifted control of production to the former CNDP. The August attack on Bisie did not occur in a vacuum. In fact, it was the most deadly incident in a series of attacks on mining sites in Walikale—the region where Bisie is located—that began in June and continued into December, when the Omate mining site was attacked on December 12. Enough interviews conducted with civil society, government officials, and the private sector in Goma confirm the linkages between this recent violence and longstanding struggles for control of Bisie’s mineral wealth with potentially devastating consequences for North Kivu’s volatile politics. Conflict between competing business interests are intertwined with political violence and underlying tensions between local ethnic groups and Congolese of Rwandan descent. According to U.N. Organization Mission in DR Congo, or MONUC, staff and North Kivu civil society representatives, the attack on Bisie was led by a former businessman from Goma, Sheka Ntabo Ntaberi, who formed his own militia and is collaborating with forces including FDLR elements and other local militias. Previously, Ntaberi was involved with three different companies that were embroiled in a longstanding dispute over rights to the Bisie concession. Now it appears that the CNDP’s takeover of Bisie has resulted in Ntaberi pursuing a military strategy aimed at destabilizing the area, possibly together with the FDLR and former 85th Brigade elements. Separating fact from rumor and keeping up with the constantly shifting alliances among armed groups and business interests in eastern Congo is difficult if not impossible. Understanding the struggle for Bisie is made more difficult because, as an international diplomat told Enough, “The fight is for shares of the pie, not absolute control of the trade.” But the patterns of violence around Bisie suggest that mineral resources remain an objective for competing armed groups. Moreover, these networks use inflammatory grievances to mobilize support. Civil society representatives told Enough that the conflict over Bisie was not just about control of the minerals, but a means of channeling deep insecurity around ethnicity and land in Walikale territory. They said that Ntaberi was recruiting his armed group based on resentment of Tutsi and Rwandaphones among Walikale’s majority Hunde population, especially concerns about the return of Congolese Tutsi refugees from Rwanda. Although the actual anticipated number of refugees returning to Walikale is quite small compared with other areas, the issue nonetheless remains dangerously volatile and a potential flashpoint for political, ethnic, and economic conflict. Bisie’s fate is of crucial importance to wider mining sector reform in eastern Congo. With a modicum of security and the government’s willingness to quash the squabbling over rights to the mine, the lion’s share of the tin trade in North Kivu could be made traceable and developed into a crucial source of “clean” Congolese tin. Long overdue investments in basic infrastructure and social services could begin to improve the quality of livelihoods dependent upon the mine, and bring its medieval working conditions up to a minimum level of decency. The Kimia II operations in North and South Kivu have dislodged the FDLR from areas where they had been entrenched for years, controlling mining sites, intermarrying with Congolese populations, but maintaining an exploitative hold over these same populations. The good news is that for the first time in years critical mining-dependent areas in South Kivu are no longer controlled by armed groups opposed to the state—including those located in Shabunda, Mwenga, Walungu, and Kalehe territories in South Kivu. This has enabled some long overdue movement toward reconnecting these isolated areas of South Kivu with the rest of the province, including beginning to rehabilitate the Bukavu-Shabunda road. Although the Congolese army took control of mining sites, it has proven woefully poor at protecting civilian populations, oftentimes using the same tactics as the FDLR to intimidate and exploit miners and their families. According to Human Rights Watch, the army is now the number one perpetrator of sexual abuse against women in eastern Congo. This includes forcing civilians to serve as porters, carrying heavy loads of minerals as well as other supplies. Village chiefs that failed to mobilize enough porters have been arbitrarily arrested and communities have been subjected to illegal taxation by military units, which at times have given way to violence and killings. Some of the same commanders implicated in horrific massacres, including the slaughter of Rwandan Hutu refugees at Shalio, have been identified as directly profiting from the minerals trade. Moreover, multiple sources have reported to Enough that Congolese army units stationed at lucrative mines are closely connected to senior officers in Congo’s capital Kinshasa, and cannot be reined in by provincial authorities. The increasing involvement of military units may also be impeding efforts to formalize the minerals trade, as military units are forbidden from engaging in mining under Congolese law. Mining officials in North and South Kivu indicated to Enough that military activity probably constitutes a significant portion of the underground trade in minerals. Pressure from the United Nations and international campaigners were widely cited as potential threats to the trade in minerals from eastern Congo, and by association with the possibility of a de facto embargo on Congolese minerals. When metals trading company Traxys suspended purchasing from eastern Congo in May 2009, John Kanyoni, head of the association of minerals exporters, or “comptoirs” in North Kivu, predicted: “Buyers will look elsewhere for tin, threatening thousands of people who genuinely eke out a living from mining and dealing in the mineral." On the contrary, data provided to Enough by the Congolese government indicates that the minerals trade mostly weathered the shock from Traxys’ decision to suspend its operations in Congo, as detailed in the appendix to this report. Of potential greater consequence to the Congolese trade was the September 14, 2009 announcement by Thaisarco, a Thailand-based tin smelter subsidiary of London-based Amalgamated Metals Corporation, that it would suspend purchasing from Congo. Thaisarco is one of two major smelters known to source from Congo—alongside Malaysia Smelting Corporation—and is widely considered to purchase large amounts of tin ore both directly from Congolese sources as well as from international metals traders. Its decision could substantially affect the international appetite for Congolese minerals. That said, data obtained by Enough indicates that Thaisarco was purchasing significant quantities of tin ore directly from Congo as recently as August, and their statement’s wording that they would “continue to honour existing contractual commitments until their expiry” suggests that the company may still be purchasing Congolese minerals even now. The notion that Traxys and Thaisarco’s decisions are creating a domino effect that will dry up all international demand for Congolese minerals appears premature for two reasons. First, the only companies that have made such decisions are those named by U.N. experts as knowingly purchasing from sources linked to the FDLR. It remains to be seen whether other companies that have avoided such censure will be so quick to relinquish their access to Congo’s mineral wealth. Second, some of the international traders and refiners that have been purchasing minerals from eastern Congo may depend more on these sources than they admit. Despite the fact that Congo’s production of the mineral ores that produce the 3Ts and gold is relatively low compared to worldwide production, it appears that particular mineral refining operations, especially those based in Thailand and Malaysia, are facing low levels of domestic production and have responded by looking abroad to Congo. The interdependence between these multinational companies and their suppliers in Congo presents an opportunity. The threat of losing access to suppliers because of the reputational damage, combined with the pressing need to keep supplies from Congo flowing, suggests an opportunity for these companies to exert far greater due diligence down through the supply chain. Industry-driven reform efforts, discussed in more detail below, reflect such calculations by these key actors. Intense pressure on the Congolese minerals supply chain in the wake of the U.N. investigations and a rising tide of international interest invigorated efforts to establish a legitimate, formal supply chain under the control of Congo’s state authorities. On August 8, Kinshasa dispatched a high-level delegation consisting of Prime Minister Adolphe Muzito and Minister of Mines Martin Kabwelulu to North Kivu to evaluate eastern Congo’s mining sector. Muzito travelled to Walikale, where he stated the government’s determination to bring the mining sector under state control and to remove the military from the mines. The prime minister’s visit was greeted with skepticism among some civil society groups in the Kivus, who perceived a degree of political pandering and populism from a party sorely in need of shoring up its sagging popularity in the east. However, interviews with mining officials in both North and South Kivu indicate that the government has developed a planning process for the minerals sector that will follow on the prime minister’s policy statement. In South Kivu, Provincial Minister of Mines Colette Mikila travelled to the interior of the province for the first time, visiting Shabunda from September 1 – 4 to assess the situation in the field, with plans for the reform of the sector to be presented to the government by year’s end. Importantly, the government is specifically addressing the critical question of achieving a traceable supply chain for minerals, as well as related questions about combating fraud and contraband. Kinshasa’s growing interest in reforming the mining sector in eastern Congo is long overdue. That government officials are only now visiting mining areas, more than three years after elections, indicates the degree to which the minerals trade in the Kivus has been ceded to armed groups and shadow networks. Shifting this dynamic will require more than statements and one-off visits—it will require dedicated resources and political will from President Joseph Kabila himself. The good news is that such a move may be in Kabila’s interest. He won the 2006 election thanks to a vote bank in eastern Congo where his popularity has since plummeted. Delivering benefits to this population may be his only shot at prevailing in 2011 in a credible electoral process. However, this would require cracking down on some of his own inner circle, including powerful politicians, military commanders, and business elites, to demand that they alter their practices and bring the mineral trade in eastern Congo into the sunlight. In debates over eastern Congo’s future everybody agrees that restoring state authority and developing security forces with basic capacity to protect the population is the key to peace. How to accomplish these tasks is more difficult to articulate, and the series of crises that have wracked the Kivus over the years since the 2006 elections have often distracted from this fundamental question. Nonetheless, the political space created by the Rwanda-Congo détente has reinvigorated attempts to try. Toward this end, the Congolese government and MONUC have put pen to paper and developed an integrated plan entitled, “The Stabilization and Reconstruction Plan for Zones Emerging from Armed Conflict.” Based on a stabilization plan developed by MONUC in early 2008, the plan consists of three elements: security, humanitarian and social issues, and economic revival, with ambitious plans to cover six provinces in eastern Congo. Importantly, the stabilization plan recognizes that dealing with illicit exploitation of natural resources is a core security challenge in eastern Congo, and it includes a component within the security objective to install a mechanism to control mineral and forest resources to prevent their illegal exploitation by criminal groups. Over a six-month period the plan envisions deploying mining authorities at the subprovincial level with offices in Beni/Lubero and Walikale in North Kivu and in Shabunda, Uvira, Walungu, Kalehe, Mwenga, and Fizi in South Kivu, as well as assorted locations in Maniema, Orientale, and Katanga. At these buying centers, authorized state authorities would be placed under one roof at transportation hubs, where they would be able to collect official taxes, compile statistics, and certify the origins of minerals. The plan also calls for implementing Congo’s Mining Code and establishing a system of permits for artisanal exploitation of minerals, an aspect of the law that has been slow to be put into practice in eastern Congo, leaving the vast majority of miners operating in an ambiguous quasi-legal state. To demilitarize the mines the plan calls for placing mining sites under the control of legitimate authorities and deploying officials from the mining ministry, its certification authority, and antifraud agents at mining sites themselves, as well as identifying airports and landing strips used to transport minerals and developing proper oversight systems. At airports, ports, and border crossings, the plan calls for placing state authorities under one roof, developing a one-stop shop for applying both mining and forestry laws. Such a system would build upon MONUC’s commencement of random checks of aircrafts and boats to combat contraband, which began in June 2009. Although MONUC has reported the seizure of illicit minerals as a result of these checks, Enough understands that they are extremely limited in scale and scope. Even a modest augmentation of such efforts could help deter the wholesale smuggling of minerals and other illicit trade across Congo’s porous borders. Much more detailed plans will be required to properly assess the viability of the natural resource control elements of the stabilization plan, but its existence and incorporation of these issues is a welcome step forward. The establishment of buying centers would not ensure traceability of minerals back to their specific mines of origin, but they would provide an important first step to reasserting the regulation of the trade by legitimate authorities rather than armed groups and military units. Ultimately, getting the mines out of armed groups’ control will depend on the ability of the Congolese state to exercise control over its own security forces, which would provide the opportunity for other state agents, from mining inspectors to customs authorities, to be able to do their job and to be held accountable for fraud. This task is gargantuan, well beyond the six-month timetable of the plan. But the size of the challenge should not preclude first steps in the right direction. Contingent upon rigorous operational plans, international donors should support stabilization efforts and provide funding to begin the process of reforming the mining sector in the east. Renewed international attention to Congo’s conflict minerals has provoked an unprecedented response from actors engaged in the trade, from exporters in Goma and Bukavu to metals traders and smelters operating in Europe and Asia, all the way to the electronics companies that manufacture and market mobile phones, laptops, and music players. Although the United Nations and nongovernmental organizations have “named and shamed” companies involved with armed groups in eastern Congo in the past, these efforts have previously had little effect on trade dynamics. However, the 2008 U.N. Group of Experts report and the subsequent decision by metals trader Traxys to suspend purchasing from Congo does appear to have rattled both international and Congolese actors in the supply chain, and has sparked efforts by industry to develop higher standards of due diligence. While there is clearly more enthusiasm among some members on industry than with others, increased engagement on these issues is a good thing. The International Tin Research Institute, or ITRI, is a membership organization that represents the world’s leading tin smelters. Among its members are the two major smelters that have been confirmed as purchasing minerals from eastern Congo—the Malaysia Smelting Corporation and Thaisarco. In response, these companies formed a working group together with Traxys to develop an action plan to implement more rigorous due diligence procedures that would enable companies to continue to purchase from the Congo while seeking to exclude armed groups and military units from the supply chain. The tantalum industry has put forth a similar initiative as well. The ITRI Tin Supply Chain Initiative, or iTSCi, presents a phased approach to improving due diligence and traceable supply chains within the Congolese tin industry. Phase 1 involves improving practices in the already formalized links in the supply chain—ensuring that exporters complete paperwork attesting to the chain of custody for the minerals they export. Phase II involves expanding the project to actually verify mines of origin. Phase III would achieve a more comprehensive program that not only verifies the provenance of minerals, but also measures performance against a range of standards including supply chain mapping, chain of custody, legitimacy, business ethics, and avoiding conflict finance. Timelines for implementation of the initiative lack precision, and they are dependent on external funding. A number of issues with this initiative remain. The most important is ensuring that the initiative’s effectiveness can be independently verified and made subject to audits by third parties without any conflict of interest. There are provisions for independent auditing in the plan, but they have yet to be implemented. If the initiative fails to put rigorous third-party monitoring into practice the scheme will simply be the industry policing itself and papering over the continuing flow of conflict minerals with half measures. Moreover, the industry should take more overt responsibility for taking all possible measures to exclude conflict actors from the supply chain. Although this will require partnership with the Congolese government, the United Nations, donor governments, and civil society, the industry can do much on its own to hold its suppliers to account. On October 6, the Congolese Ministry of Mines endorsed the ITRI initiative following meetings in Kinshasa. In North and South Kivu, Enough encountered receptivity toward the plan from Congolese exporters, although they cautioned that the plan would need to be adjusted and revised to be feasible to implement on the ground in eastern Congo. Likewise, a coalition of civil society organizations in South Kivu active in supporting a process of dialogue with government and industry on mining sector reform has also called for international companies to engage with local structures to prevent a boycott of Congolese minerals that might adversely affect miners and their families. In discussions with Enough, exporters suggested that other means of achieving traceability—including strengthened efforts to formalize the traders who move minerals from mines to the major cities—could help to improve accountability for the origin of minerals. Importantly, the exporters also expressed willingness to be more transparent, including providing detailed information on their finances and taxes. This could help ensure that the taxation of the minerals trade benefits Congo’s state coffers rather than fueling corruption. Ultimately, the reputation of the companies dealing in eastern Congo’s minerals will depend not on intentions and plans, but on the concrete actions that result. The actions that will build the credibility of industry-led initiatives include companies willing to accept independent audits and suppliers ready to stop purchasing from companies that fall short of providing adequate due diligence or whom are shown to be continuing to source from militarized mines. The economic underpinnings of Congo’s persistent conflict have been on the international agenda for nearly a decade, with many of the same individuals and companies continually linked to the trade in conflict minerals over that period. But the unprecedented surge in international attention to this issue over the past 12 months has created new opportunities for a concerted effort to break the link between Congo’s resources and violence. Sustained attention and well-coordinated action from governments, companies, activists, and civil society organizations will make or break this effort. We can only expect more of the same half measures that only scratch the surface of the problem absent a coherent approach that couples international initiatives with on-the-ground efforts to seize eastern Congo’s mineral trade back from the mafia networks. Moreover, without a credible initiative to manage the supply chain companies are more likely to cut off all engagement with Congo. The legislation pending in the United States and the drive by Secretary of State Hillary Clinton to tackle conflict minerals has already spurred some action from the Congolese government and private-sector representatives, but unless these efforts remain closely aligned with and informed by developments in the field, they could prove counterproductive. Likewise, strong international oversight will be required in the short term to help counter the pervasive influence of the many vested interests at odds with efforts to put eastern Congo’s mineral wealth at the service of its people. Developing a coalition of private and public actors ranging from the largest of multinational electronics and jewelry companies all the way to the most knowledgeable and dedicated Congolese civil society voices from the mineral rich areas of the Kivus will be necessary to finally break the cycle of mineral-fueled violence in eastern Congo. This report is based on field research during travel to North and South Kivu during August and September 2009, as well as follow up research by Noel Atama and Olivia Caeymaex during October and November. Unless otherwise noted, references in this report are based on interviews with civil society activists, minerals traders, Congolese government officials, and U.N. staff in Goma and Bukavu from August 25 through September 9, 2009. U.N. Security Council, “Final Report of the Group of Experts on the Democratic Republic of the Congo,” S/2009/603 (November 2009). For Enough’s analysis of this operation, see Colin Thomas-Jensen, Noel Atama, and Olivia Caeymaex, “An Uneasy Alliance in Eastern Congo and its High Cost for Civilians: Operation Kimia II,” Enough Strategy Paper, September 2009. United Nations, “Press Conference on Final Report by Democratic Republic of Congo Experts Group,” available at http://www.un.org/News/briefings/docs/2009/091207_Mahtani.doc.htm (accessed December 21, 2009). See U.N. Security Council, “Final Report of the Group of Experts on the Democratic Republic of the Congo,” S/2008/773 (December 2008) and Global Witness, “Faced With A Gun, What Can You Do? War and the Militarisation of Mining in Eastern Congo” (July 2009). The CNDP previously controlled relatively few mining sites and profited more from general taxation of trade in regions under their control, especially at key border post. See U.N. Security Council Report, “Final Report of the Group of Experts on the Democratic Republic of the Congo,” S/2008/773. Radio Okapi, “Walikale: attaques des FDLR, 1 mort, 11 villages vidés de leurs habitants,” December 13, 2009. U.N. Security Council, “Final Report of the Group of Experts on the Democratic Republic of the Congo,” S/2009/603, pp. 54-56. Interview with western diplomat in Goma, August 27, 2009. Human Rights Watch, “You Will Be Punished: Attacks on Civilians in Eastern Congo” (December 2009). Notably Lt. Col. Innocent Zimurinda, whose role in the Shalio massacre is described by Human Rights Watch, and whose role in minerals extraction is described in the 2009 Group of Experts report on p. 56-57. Quoted in Metal Bulletin Weekly, “Sellers concerned by Traxys's withdrawal from DRC tin market,” May 11, 2009. ITRI, “Top Tin Producing Companies 2008,” available at http://www.itri.co.uk/pooled/articles/BF_TECHART/view.asp?Q=BF_TECHART_285697. Raf Custers, Jeroen Cuvelier, and Didier Verbruggen, “Culprits or Scapegoats? Revisiting the Role of Belgian Minerals Traders in Eastern DRC,” (Antwerp: International Peace Information Service, 2009). ITRI, “Tin Supply from the Democratic Republic of the Congo,” available at http://www.itri.co.uk/POOLED/ARTICLES/BF_PARTART/VIEW.ASP?Q=BF_PARTART_310250. See Electronic Industry Citizenship Coalition, “EICC & GeSI Join with Tantalum Supply Chain Representatives to Improve Responsible Sourcing,” Press release, September 28, 2009, available athttp://www.eicc.info/PDF/Tantalum%20Supplier%20Meeting.pdf. U.N. Security Council, “Final Report of the Group of Experts on the Democratic Republic of the Congo,” S/2009/603, p. 72. Data provided by North and South Kivu mining authorities provides a view of the mineral trade in Congo’s conflict zones during the first half of 2009. Given the severe challenges to obtaining comprehensive and reliable data in eastern Congo, these statistics are by no means authoritative, and a close look at these figures raises more questions than it answers. The most recent U.N. Experts report makes explicit this challenge, noting the huge discrepancies between statistics recorded by the mining authorities and actual exports by particular companies. Nonetheless, this information does provide some basis for evaluating the impact of recent events on the trade. Tin ore exports began 2009 at low levels, especially in South Kivu, which exported only 100,000 kilograms in January. Exports then rose up to more than 500,000 kilograms by May. Although they did fall back below 300,000 kgs in July, statistics for August indicate a rebound. Likewise, in North Kivu, monthly exports have mostly remained within the range of 700,000 to 1,000,000 kgs. Source: Division of Mines, North/South Kivu. What other factors may have influenced the minerals trade during 2009? The most likely factor is the world price of tin as determined by the London Metals Exchange. The trendlines in the world price, with strong gains in during April and May followed by a dip in June and July, broadly match the pattern of exports reported out of the Kivus. This matches analysis by experts that link trends in the trade in Congo to world price fluctuations. Insecurity was cited by both the private sector and civil society as also contributing to the slowdown in the trade. The president of the Association of Negociants in South Kivu told Enough that many middlemen had closed their doors as a result of the war, and that important trade routes to minerals mined outside of the conflict zone in northern Katanga and Maniema had been blocked by fighting. Where are Congolese minerals going? Data provided by the Division de Mines for North Kivu provides a snapshot view of what countries and companies received exports from the province. This information can be misleading because most of these companies are metals traders, rather than the smelters and processors that are the actual destinations for the minerals. However, the data underlines the continued importance of Belgian metals traders and smelters and processors in Asia to the Congolese trade. Of particular note are the shipments to smelters Thailand Smelting and Refining (Thaisarco), which announced it would suspend purchasing only a few weeks later. Comptoirs Sodeem, Hill Side, and Pan African Business Group were all identified by the U.N. Experts as sourcing from Bisie mine in Walikale. The Coltan supplied by MH1 to African Ventures was also noted by the U.N. Experts Group as sourced from a militarized mine operated by former CNDP elements in Masisi, North Kivu. African Ventures supplied this coltan to Refractory Metals and Mining according to the U.N. report. The South Kivu Division of Mines informed Enough that the number of comptoirs actively exporting minerals declined significantly during the Summer 2009, with only 4 of 16 registered comptoirs operating at full capacity. Three of the five comptoirs cited by the U.N. Group of Experts as selling minerals from FDLR-controlled mines to international companies were operational and exporting during this period. It is important to note that because U.N. investigations named particular companies rather than individuals, it is possible that some of these companies may have suspended operations in an effort to avoid being targeted for sanctions. In fact, the U.N. Experts report that Bukavu-based comptoir MDM, which announced it had suspended operations, was in fact continuing to trade in minerals from FDLR mines under the name of WMC, another comptoir also cited by the Group of Experts.